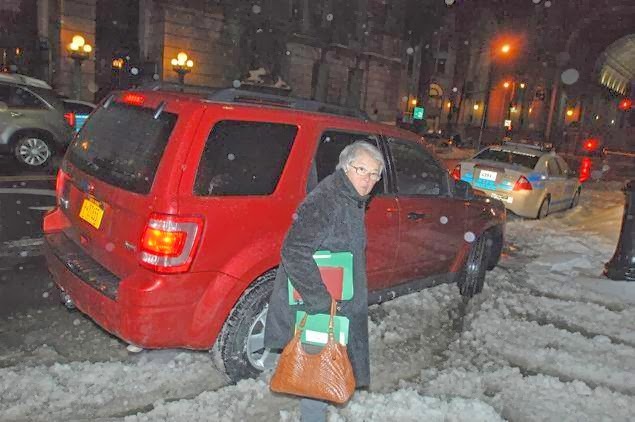 NYC Chancellor Carmen Farina looks a little unhappy as she struggles with her soon-to-be-public anger and frustration with reporters, parents and teachers who will just not stop throwing darts at her for keeping the schools open during the latest snowstorm on February 13, 2014. Carmen does not like people who expose her inner corruption and arrogance, or who dare to challenge her and not be afraid of the ever-present threats to life and family. SNOWGATE is only the first scandal. On Wednesday, Mayor Bill de Blasio issued a hazardous travel advisory for Thursday and Friday, warning New Yorkers that the latest round of the never-ending Snowpocalypse will make the morning and evening commute "extremely difficult." "If you do not need to drive, you will help yourself and everyone else by staying off the roads," said De Blasio. "Take mass transit and leave extra time — it will be slow-going for everyone tomorrow." That sounds like the prelude to a school-closing announcement, but the Department of Education said classes are still on for tomorrow – though last time, more than half of all students just didn't show up. 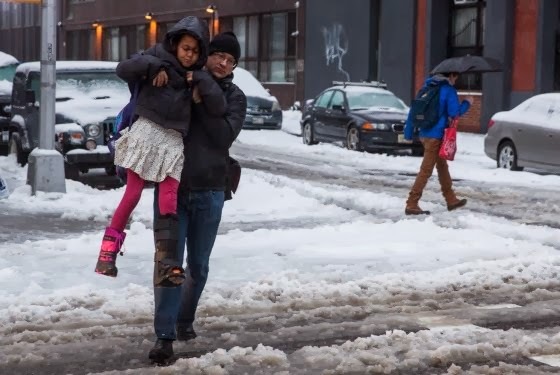 There's only been one snow day so far in De Blasio's New York, and many parents were angry that school remained open during the last big storm. "Damned if you do, damned if you don't," Carmen Farina, the New York City Schools Chancellor, told ABC New York, adding that many kids only get a hot meal at school, and no one will be home to care for them. "Parents have to go to work. You didn't hear of any businesses in the city of New York closed down. Macy's was open. So if people can go shopping and go to work, then kids can go to school," Farina said. The federal government has already closed its offices in the D.C. area for Thursday, and on Twitter many are calling for Netflix to make the snow day even sweeter by posting season two of House of Cards a day early. Netflix has yet to respond, but it does seem like something they'd do. In that case, it's going to be a particularly rough day for the many NYC schoolchildren desperate to see what Frank Underwood does next. We all remember the short - 3 month - Chancellorship of Cathie Black, right? Let's hope we can remove Carmen Farina in less time. Due to inclement weather conditions, all student after-school and PSAL activities are cancelled today, Thursday, February 13, 2014. Schools are open. Families with busing questions should contact the Office of Pupil Transportation at 718-392-8855. Parents, as always, should exercise their own judgment with regard to their children. Safety is a top priority for the Department. School administrators may want to be even more aggressive in calling for weather-related closures. A new study conducted by Harvard Kennedy School Assistant Professor Joshua Goodman finds that snow days do not impact student learning. In fact, he finds, keeping schools open during a storm is more detrimental to learning than a closure. Goodman, a former school teacher, began his study at the behest of the Massachusetts Department of Education, which wanted to know more about the impact of snow days on student achievement. He examined reams of data in grades three through 10 from 2003 to 2010. One conclusion — that snow days are less detrimental to student performance than other absences — can be explained by the fact that school districts typically plan for weather-related disruptions and tack on extra days in the schedule to compensate. They do not, however, typically schedule make-up days for other student absences. Goodman, an assistant professor of public policy, teaches empirical methods and the economics of education. His research interests include labor and public economics, with a particular focus on education policy. three-month tenure, is seen as one of Bloomberg's worst missteps. Schools Chancellor Carmen Farina cluelessly defended the decision to keep schools open during Thursday’s lethal Nor’easter – incredibly saying “it’s a beautiful day out there,” as snow and freezing rain fell outside. “It has totally stopped snowing. It’s absolutely a beautiful day out there right now,” she said at a morning news conference in Brooklyn with Mayor Bill de Blasio. She also said that because people were out and about, it must be nicer out. “I guess the other thing, in looking out the window … there’s a lot of people on the streets,” she said before cracking a flippant joke. “Obviously it’s not as nice as it is where my husband is in South Beach, but it’s a lot better than it was before.” ” she said, as she and de Blasio burst out laughing. “It’s getting warmer … theoretically, the snow will start melting,” Farina added. De Blasio and Farina then haughtily defended their call Wednesday night at 10:33 p.m. to keep schools open – at the same time forecasters were predicting up to 10 inches of snow in the city. “Unlike some cities, we don’t shut down in the face of adversity. 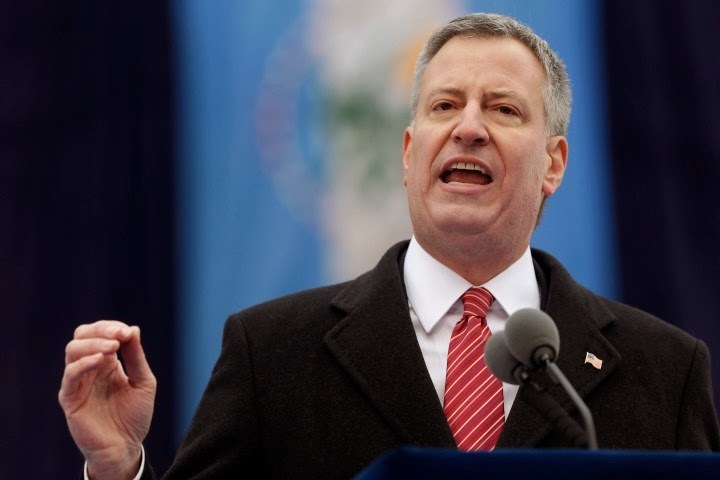 I’m going to make decisions based on the information we have,” de Blasio boasted. “There is the illusion you can have perfect information and perfect decisions,” de Blasio said. But their comments did little to mollify parents, teachers and students who took to social media to harshly criticize their decision to keep schools open. “Why the public school system is open today in these conditions is astounding. Putting the lives of teachers, administrators, and most importantly, children, in danger by telling them to travel in this weather is incomprehensible. 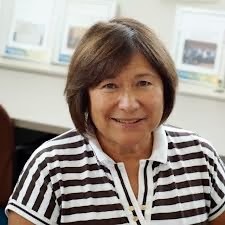 Chancellor Farina and the DOE staff: you have some serious explaining to do,” said James Hong on the Department of Education’s Facebook page, which had hundreds of negative comments. School attendance was down to 45%, according to the Department of Education. The mayor also said Farina was spot on when she said earlier that it is important for the schools to be open because for many kids it’s the only place they can get a decent meal — a comment that angered many parents. “We have a huge number of parents, their kids getting to school means their children will have a good meal, in some cases two meals,” the mayor said. “A lot of parents get frustrated” if school is closed, he said. “The bottom line is, we made a decision that was right,” de Blasio stubbornly insisted. “The facts on the ground speak for themselves. Throughout the city public transportation has been running. the precipitation levels were such that we could sustain school opening today. it’s our job to do … it’s out job to make the city function,” he said. The mayor also took a veiled shot at the National Weather Service, suggesting they low-balled their predictions. “We don’t second guess the National Weather Service. The low end suggested 2 or 3 inches by this morning. The high end estimate was more problematic, but not enough to close schools,” he said. The effort was too much for TV personality and weatherman Al Roker, who tweeted a response – from the Olympics in Sochi. “How dare @NYCMayorsOffice @NYCSchools throw NWS under the school bus. Forecast was on time and on the money,” Roker wrote. Forecasters had predicted anywhere from 6 to 10 inches of snow for the city – and the National Weather Service issued a winter storm warning, the highest level of alert. Farina also callously declared that students who were absent from school Thursday would not be given a pass for taking the day off. “At the course of a whole day, you can still get to school,” she said. The mayor and Farina also pointed out that city students have the entire week off next week, and that they were loath to give them another day off Thursday for fear that students would backslide. New York City Mayor Bill de Blasio and Schools Chancellor Carmen Fariña came under fire for their decision to keep public schools open amid a heavy snow storm Thursday morning. During a press conference updating New Yorkers on the city's response, Fariña went as far as to say "it is absolutely a beautiful day out there right now." De Blasio addressed the criticism during the update, saying it's a "different thing to run the city than to give the weather on TV." The city announced the decision to keep schools open late Wednesday evening. The city's teachers union was also among the mayor's critics. "I understand the desire to keep schools open. The only thing that trumps that is safety," United Federation of Teachers President Michael Mulgrew said in a statement. "Having students, parents and staff traveling in these conditions was unwarranted. It was a mistake to open schools today." Sol Stern: Who Is Carmen Farina? Mayor De Blasio’s new schools chancellor is a longtime champion of failed progressive pedagogy. 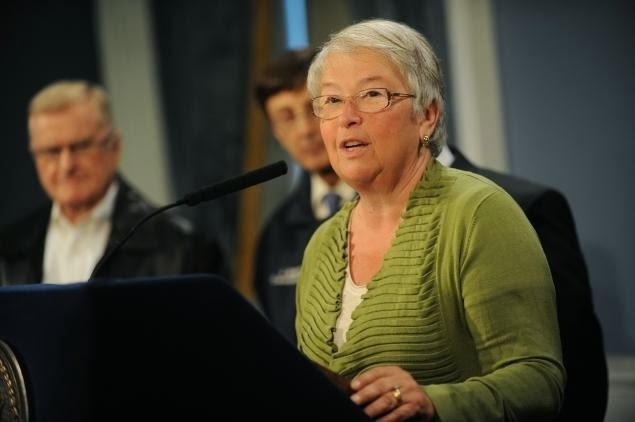 In his press conference introducing Carmen Fariña as New York City’s next schools chancellor, Mayor Bill de Blasio suggested that he had picked her over several other candidates because she was on the same page with him in opposing Bloomberg-era education reforms. 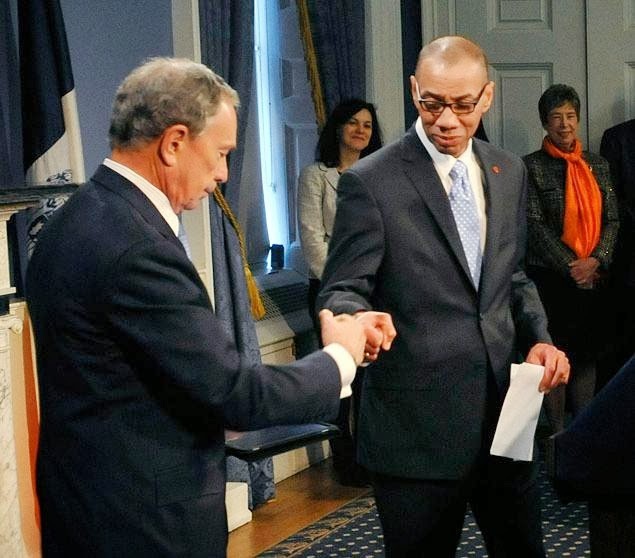 Most of the city’s education reporters took the new mayor’s spin and ran with it, even though Fariña had served loyally as Michael Bloomberg’s second-highest-ranking education official. 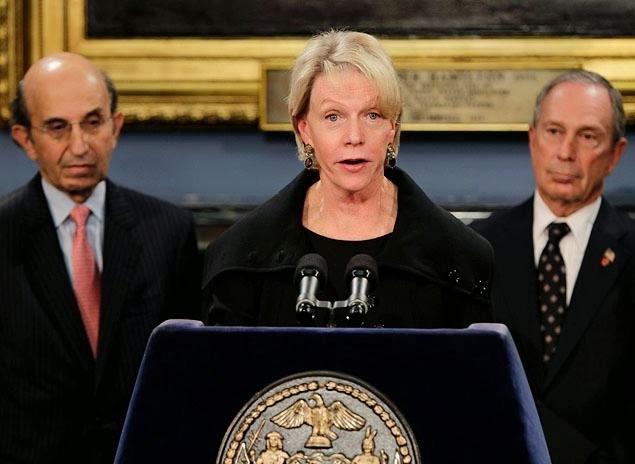 Daily News columnist Juan Gonzalez predicted that Fariña would now bring “revolutionary” changes to the department of education that she left in 2006. A headline in The Hechinger Report claimed that Fariña wanted DRAMATIC—EVEN JOYFUL—DEPARTURE FROM BLOOMBERG ERA. But that depends on what Bloomberg era you’re talking about: during the years that she served in the administration, Fariña was fully on board with its education policies. In fact, considering Fariña’s pivotal role during the first Bloomberg term in shaping the Department of Education’s radical initiatives, portraying her as a dissident from within seems absurd. Mayor Bloomberg took control of the schools in June 2002, but he knew little about what actually went on in the city’s classrooms. He appointed Joel Klein, a corporate lawyer with no background in instructional issues, as his first schools chancellor. In an early 2003 speech presenting his administration’s new education reforms, Mayor Bloomberg declared that the “experience of other urban school districts shows that a standardized approach to reading, writing, and math is the best way to raise student performance across the board in all subjects,” and therefore that “the chancellor’s office will dictate the curriculum.” And so it did. Lam soon became embroiled in a nepotism scandal and had to resign. Fariña then took over as deputy chancellor for instruction. She became the DOE’s enforcer, making sure that all teachers in the elementary schools toed the line and implemented Calkins’s constructivist methods for teaching reading and writing. Teachers received a list of “nonnegotiable” guidelines for arranging their classrooms, including such minute details as the requirement that there must be a rug on the floor for students to sit on in the early grades and that nothing but student work be posted on the walls. That’s what Fariña tried to accomplish in the early years of the Bloomberg administration—including the social-justice part. She was instrumental in creating the most centralized, top-down instructional system in the recent history of American public education. Agents of the deputy chancellor (euphemistically called “coaches”) fanned out to almost all city elementary schools to make sure that every teacher was marching in lockstep with the department of education’s new pedagogical approach. Under the rubric of “professional development,” DOE central headquarters launched an aggressive campaign to force teachers to teach literacy and math only one way—the progressive way. Each of the city’s 80,000 teachers got a six-hour CD-ROM laying out the philosophy behind the new standardized curriculum and pedagogy. The CD portrayed the world of progressive education writ large, with all its romantic assumptions about how children learn. In addition to inculcating Calkins’s balanced literacy, the DOE’s training manual celebrated the theories of an obscure Australian education guru—Brian Cambourne of Wollongong University in New South Wales, a leader of the whole-language movement (a cousin of balanced literacy) then dominating Australian public schools. Cambourne’s ideas gave city teachers not only more balanced literacy (or whole language) theory, but also a warrant for social-justice teaching. Cambourne claims that as a young teacher, he discovered that many of his poorly performing students were actually quite bright. To his surprise, almost all demonstrated extraordinary competence in performing challenging tasks. The son of the local bookie, for example, “couldn’t learn basic math,” according to Cambourne, “but could calculate the probability the Queen of Spades was in the deck faster than I could.” Cambourne decided that children learn better in natural settings, with a minimum of adult help—a staple of progressive-education thought. Thus the role of the educator should be to create classroom environments that stimulate children but also closely resemble the way adults work and learn. Children should no longer sit in rows facing the teacher; instead, the room should be arranged with work areas where children can construct their own knowledge, much as in Calkins’s workshop model of balanced literacy. Recognizing balanced literacy’s meager results, Chancellor Klein reverted to a system of more autonomous schools, giving principals far more discretion over instructional matters. Klein apparently came to believe that he had been misled by Fariña and Calkins. The chancellor then became a supporter of Hirsch’s Core Knowledge curriculum, with its focus on direct instruction and the teaching of broad content knowledge. He set up a three-year pilot program, matching ten elementary schools using the Hirsch early-grade literacy curriculum against a demographically similar cohort of ten schools that used balanced literacy. The children in the Core Knowledge schools significantly outperformed those in the schools using the Calkins approach. 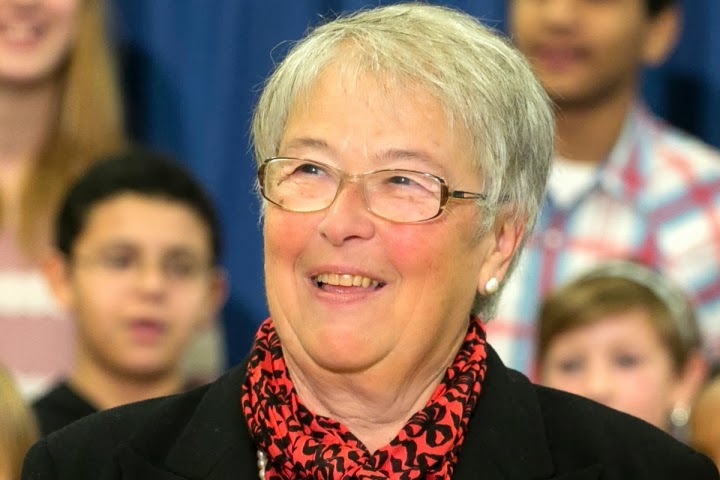 Still opposing the direct teaching of factual knowledge, Fariña recently shrugged off the pilot study, saying that not enough schools were involved. But if Fariña is serious about that criticism, she now has an opportunity to run a much larger evaluation of Core Knowledge. As a result of the city’s adoption of the Common Core State Standards and of aligned curricula emphasizing the “rich content knowledge” that the standards require, 71 elementary school principals have chosen to use Hirsch’s Core Knowledge literacy program in their schools. 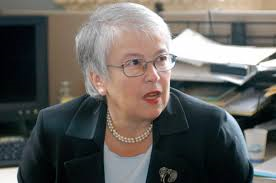 Let Fariña visit and study those schools over the next year. If she really is committed to changing the tale of two cities, as she and the new mayor claim to be, one way to start would be to cast aside ideology and judge whether those Core Knowledge classrooms, drenched in “mere facts,” are actually the key to narrowing the devastating knowledge gap between middle-class kids and poor children, who begin school with little knowledge of the world and with a stunted vocabulary. She might also find that there is at least as much “joy” in classrooms in which children get taught explicitly about the world around them as there is in classrooms in which children “construct” their own knowledge.